Our free ClareVision Plus App allows homeowners to adjust a wide range of settings including Motion Sensitivity and Area Detection. Simply fire up the App, select your doorbell header, and enable the notification settings to get started. The Clare Video Doorbell volume controls are adjustable. You can easily adjust volume settings guests hear, or what you hear on your end when speaking through a mobile device. Open the ClareVision Plus App, select the video doorbell header, and scroll down to the volume settings. Existing doorbell mounting screws can be reused without the need for any additional drilling using our included wedge or spacer. No more drilling, no more hassle, and no headache. 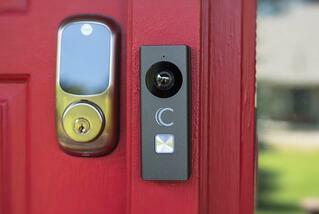 You can have a doorbell installed and ready for initiation in under 5 minutes. 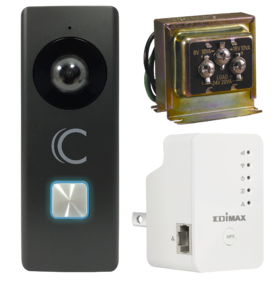 You can increase or decrease the streaming quality of the Video Doorbell. Simply tap on the HD or SD button underneath the video window, and select your desired standard. Be aware that a higher quality will use more bandwidth. You can continue to answer the doorbell in low cellular signal areas (3G) even when using SD quality. Included in each doorbell box is a diode for use on digital chimes. Install the diode on the leads of the chime to allow it to work properly. Simply wrap the ends of the diode around the terminals on the digital chime. Connecting the diode in the wrong direction will not cause harm to either device, your doorbell will just not ring properly. If this is the case, reverse the direction of the diode and verify proper installation by ringing the doorbell. Refer to the image below. Important Note: Do not install the diode when connecting the Clare Video Doorbell to any mechanical chime.